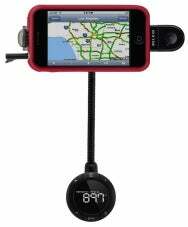 Belkin has announced two new versions of its TuneBase line of iPod/iPhone automobile mounts. Like older TuneBase models, each new model plugs into your car's accessory-power (aka, "cigarette lighter") jack, charging your iPod or iPhone while holding it in a more-visible position; you can position the cradle vertically or horizontally. But the new models also provide hands-free phone functionality. The $70 TuneBase Direct with Hands-Free sends audio to your car's stereo via a 3.5mm (1/8-inch) stereo minijack; a minijack-to-minijack cable is included. The $90 TuneBase FM with Hands-Free includes an FM transmitter to send your player's audio to your car stereo via FM radio frequencies; Belkin's ClearScan feature automatically scans the FM dial to find the best frequency. When using either TuneBase with an iPhone, if a phone call comes in, pressing the TuneBase's Call button pauses playback and routes the call's audio through your car's speakers; the iPhone's microphone continues to function, just as if you were using the phone's speakerphone mode. The TuneBase Direct will be available in the US in "early June"; the TuneBase FM will be available in mid-July.